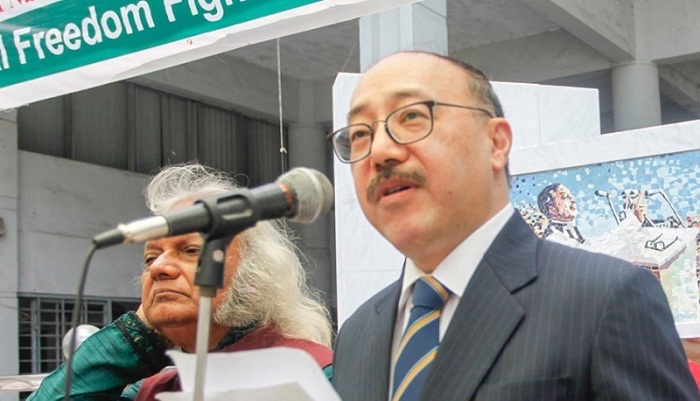 Appreciating Prime Minister Sheikh Hasina's zero tolerance policy towards terrorism, Indian High Commissioner in Dhaka Harsh Vardhan Shringla on Wednesday reiterated that Bangladesh is not alone in its fight against terrorism. The Indian diplomat came up with this support while addressing the Defence Services Command and Staff College (DSC&SC) on ‘Contemporary India, its Foreign Policy and Security Strategy: Implications for Bangladesh", UNB reports. "Our Prime Minister has already gone on record to convey that Bangladesh is not alone in its fight against terrorism. We fully support Prime Minister Sheikh Hasina's policy of zero-tolerance towards terrorism and stand by Bangladesh," said Shringla. He said Bangladesh government has taken strong and countrywide steps against terrorism and militancy especially since the attacks in July and also mobilised all sections in society against terrorism. He conveyed heartfelt condolences for the loss of innocent lives in the terrorist attacks in Bangladesh last month. “The Security Forces have played a valiant role in effectively subduing the terrorists and protecting Bangladesh against the scourge of terrorism and we salute your contribution and commitment towards peace and stability in your country," he added. The High Commissioner said India and Bangladesh are today on the same page and this is manifested in the excellent cooperation that security forces enjoy-whether it is in the form of sharing of information or apprehending criminals. "Our border guarding forces often work under challenging circumstances guarding this 4000 kilometres plus border," he added. Shringla said India and Bangladesh share a special relationship- a shared history, language, culture, ties of family and kinship. "Both nations have fought the Liberation war together, as an integrated force, a rare example in the recent history. With our soldiers having shed blood together, the bonds we share are eternal and will always stand the test of time. India's longest border (4096) kilometres is with Bangladesh." He said destinies of the two countries are inter-linked and are partners in progress and development. Shringla said their relations with Bangladesh today have become a paradigm of success they wish to replicate with their other neighbours as well. "It’s an example of how two neighbours can cooperate if they sit down to discuss all issues and if the leadership is committed to the development of the people." He said this is just the beginning; they have a long distance to cover and if two countries continue to work together they can transform this region to make it a model of growth and development.